Last year, in lieu of making a new year's resolution, I instead made a 2010 New Year's List-- A long laundry list of things that I hoped to accomplish during the year. It worked well because I'm hugely motivated by crossing items off a list. 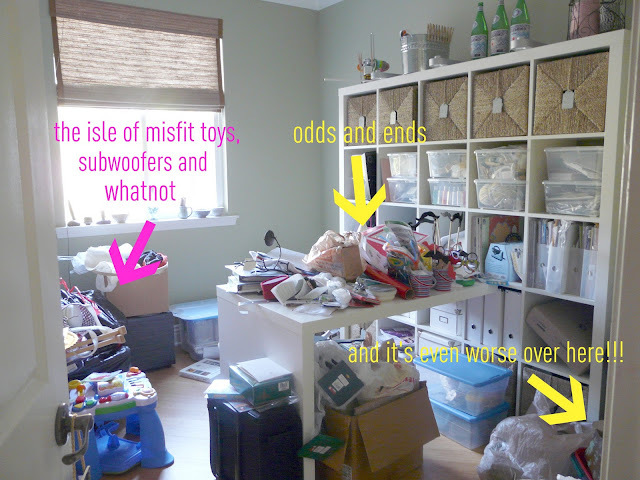 However, since we were still settling into our house last year, the "list" was ridiculously long. So it's no surprise that there's some things that I never got around to completing. probably not surprising that this is at the top of my list. my blood pressure will be happy once this room is straightened out! oh, and this picture was taken after i worked on it a few days. it looks MUCH better than when i started! Not enough storage space. Too cluttered for me to walk into, let alone work in. I bought the large expedit and it's a start, but i need more practical storage space. Must go vertical! Donate the misfit toys that somehow ended up in there. And how did that gigantic sub-woofer end up in there too? Tripping over shoes, book bags & discarded jackets. Most of the paperwork is still in boxes, artwork is still not hung. Purchased and set-up the furniture. encourage The Mister to finish cleaning out the garage so I can park inside! Find time to hang out with the girls more often. Well, it's nice to have everything written out, but I'm going to need a huge amount of energy and drive to get through this list. Extra hard with youngsters underfoot. Come this fall, when Smarty Pants starts Kindergarten and Happy Vee is in Preschool (and I have 2.5 hours of solitude), I just may actually make a dent in it! Do you have a 2011 "to-do" list? What are you tackling this year?